The 5 Servo Turret Controller is ideal for boats that have gun turrets or other items that you would like to position from you radio. The unit has up to 200% travel adjustment, initial start position and speed adjustment between 4 and 24 seconds on each servo. 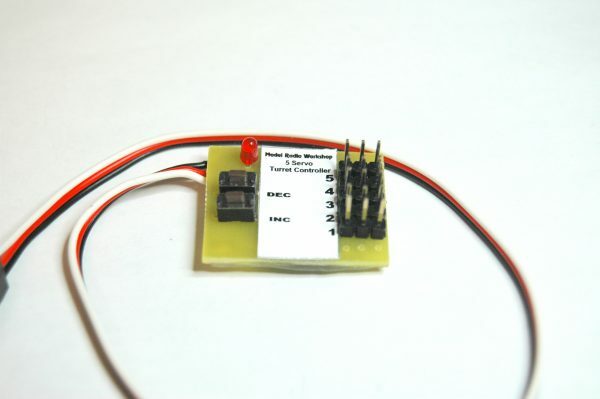 5 servos can be controlled from one transmitter channel. Servo travel up to 200% can be programmed. Stop points each side of neutral can be individually set on all servos. Stop points can be individually cleared on all servos. Servo travel direction can be individually set for all servos. Servo transit times between approximately 4 seconds and 24 seconds can be individually set for all servos. Servo start-up position can be individually set for all servos. Reset to factory default is available. Plug the flying lead on the Multiple Turret Controller into the selected channel on your receiver. Connect the servos to the Multiple Turret Controller. Switch on the transmitter and then the receiver. The servos will move to their selected start-up positions. All servos vary and because of the expanded travel the servos may be driven against their mechanical stops. Do not leave a servo driving against its stop or damage to the servo may occur. The maximum travel positions (electronic stop points) and the speed of transit can be adjusted by performing the set-up procedure. The servos are controlled by moving the operating stick a number of times from neutral to one side to move the selected servo in one direction and from neutral to the other side to move it in the other direction. With the transmitter stick at neutral, the servos maintain their position. The unit counts the number of times that the stick is at the extreme and moves the appropriate servo. The operating stick can be moved as fast as your radio system can respond but the servo will not activate until the stick has been at the extreme for about half a second. Similarly, the system will only reset after the stick has been at neutral for more than half a second. The delay tells the Multiple Turret Controller that the stick sequence is complete. This means that you must pause for more than half a second to allow the system to reset before starting a new stick sequence. If you move the stick too slowly, the system will continuously reset and only operate servo one. To control the first servo, move the stick to one side. The first servo will move in one direction while the stick is at the extreme. When the stick is returned to neutral, the servo will maintain its position. If the stick is moved from neutral to the other side, the servo will move in the opposite direction while the stick is held at the extreme. In this way, the stick can position the servo anywhere on its travel from one extreme to the other. To control the second servo, move the stick to one extreme, return it to neutral and then move it a second time to the extreme. The second servo will move while the stick is at the extreme and maintain its position when the stick is returned to neutral. If the stick is moved in the same sequence, extreme – neutral – extreme, but in the opposite direction, the servo will move in the opposite direction while the stick is at the extreme. The stick sequence, extreme – neutral – extreme – neutral – extreme (and hold) controls the third servo. The stick sequence, extreme – neutral – extreme – neutral – extreme – neutral – extreme (and hold) controls the fourth servo. The stick sequence, extreme – neutral – extreme – neutral – extreme – neutral – extreme – neutral – extreme (and hold) controls the fifth servo. As an aid to practice, the LED will light each time the stick is at the extreme and go out when the selected servo is detected. Before operating or adjusting your Multiple Turret Controller, set the transmitter operating channel travel to 100%. You may find it easier to accurately set the stop points if the servo speed is set to minimum (five flashes). Use the stick to position the selected servo at the required stop point on one side of neutral. With the stick at centre, press and immediately release the “+” key. Do not press the key for too long or the system will enter the speed set-up. The LED will flash to indicate that the stop position has been stored. During operation, the servo will not move past the position set. Repeat this procedure with the servo at the other side of neutral to store the other stop point. Please note that the stop point stored is for the last servo moved. Transit times depend on the stop point positions so it is best to set the stop points before setting the final speed. With 150% travel, transit times between about 4 seconds with one flash and 25 seconds with five flashes can be set. Use the stick to position the selected servo at the required stop point on one side of neutral. With the stick at centre, press and hold the “+” key. The LED will repeatedly flash five times and then pause. Each flash represents a delay unit of transit time. The servos will move more slowly as the delay units are increased. When the required number of flashes have been seen, release the “+” key. The unit will exit the set-up and the selected servo will operate at the selected speed. Use the stick to hold the selected servo at the stop point to be removed. The stick must be at its extreme position. Press and release the “+” key. The LED will flash and the servo will move past the stop position to confirm that the stop point has been cleared. The default is to have all servos start at neutral. If you wish to change this, use the stick to position the selected servo at the required new start-up position. With the stick at centre, press and release the “-” key. The LED will flash to indicate that the start-up position has been stored. At the next switch on, the servo will take up the new start position. Press and hold the “-” key and switch the unit on. The LED will light until the key is released to confirm that the reset has occurred. The unit remembers all settings and it is only necessary to adjust the servos initially and when making adjustments. Please ensure that the selection keys cannot be pressed accidentally while the unit is in use.